When I started Mummy C’s I genuinely thought that I would be inundated with requests for cakes based on frozen, peppa pig, minions or the latest film that every child is mad on. The Paw Patrols, Doc Mcstuffins & Octonauts that my kids subject me to on a daily basis! Don’t get me wrong, I’ve made my fair share of these, but the thing that I didn’t really expect was the amount of weird bespoke cakes that I would actually be making. To have a request so individual that you know, beyond a shadow of a doubt, it will be the first and only time you make it! When people order these kind of cakes sometimes they explain why they have requested something so unusual unique, other people merely order and leave me wondering. 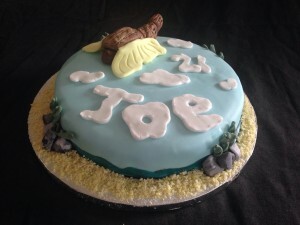 Now don’t get me wrong, I LOVE LOVE LOVE making these cakes, and when I get a request for a lady lying on a sun lounger, with a glass of wine, next to a kidney shaped swimming pool (one on order) I get super excited! To to make icing people & animals based on photos. To have a lot more say in the final product allowing the creativity to flow freely! To have a small peak into peoples ‘in jokes’ whether I understand them or not! It means I get to make something truly one of a kind and special which never fails to put a smile on my face! So please keep asking for the pregnant wonder women, the hidden black mouse, the ‘KOM’ crown, the cup of tea, the ‘to do’ list, the slimming world breakfast and all the other little gems hidden that only the birthday boy/girl would notice & appreciate. At the end of the day what better way to show someone that not only do you love them, but you also know just what THEY love. 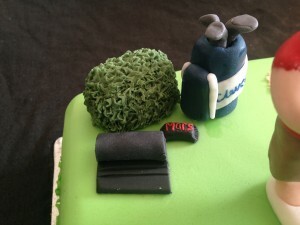 Bespoke cakes say it all…With icing on top!! !